В предыдущих разделах было описано , как собрать ядро. Настало время его установить и запустить. Все команды выполняются из-под рута. Почти во всех дистрибутивах есть скрипт installkernel , который может быть использован ядром в режиме автомата, при этом модифицируется бут-лоадер. Обычно этот скрипт лежит в пакете mkinitrd. Будут проинсталированы все необходимые модули. Модули лежат в каталоге /lib/modules/ kernel_version где kernel_version - версия вашего нового ядра. Ядро статически устанавливается в каталог /boot , в названии исполняемого файла ядра при этом присутствует номер версии. Создается ramdisk-образ с использованием модулей и modules_install. В скрипт загрузчика будет добавлена новая строка. Теперь можно попробовать загрузиться. Новая инсталляция никак не затронет уже существующие версии ядра, поэтому всегда можно будет сделать откат в случае неудачи. Если загрузка не проходит,это может быть из-за отсутствия ramdisk image. Для этого нужно выполнить команды , указанные выше. echo "Installed $SRC_RELEASE for $ARCH"
Для линукса есть 2 основных загрузчика- GRUB и LILO. GRUB используется чаще , некоторые вещи в нем сделать легче , чем в LILO, но и LILO неплох. Рассмотрим их оба. Если он есть , значит у вас LILO . Добавление нового ядра и там , и там различны. Сохраняем файл , перезагружаемся , в меню загрузчика появляется новая строка, ее и выбираем. При загрузке выбираем новую строку . Inevitably it happens: you have a custom-built kernel, working just wonderfully except for one little thing that you know is fixed in the latest release from the kernel developers. Or a security problem is found, and a new stable kernel release is made public. Either way, you are faced with the issue of upgrading the kernel and you do not want to lose all the time and effort that went into making that perfect kernel configuration. This chapter is going to show how easy it is to update a kernel from an older versions, while still retaining all of the configuration options from the previous one. First off, please back up the .config file in the kernel source directory. You have spent some time and effort into creating it, and it should be saved in case some - thing goes wrong when trying to upgrade. Get the new source code. Apply the changes to the old source tree to bring it up to the newer level. Reconfigure the kernel based on the previous kernel configuration. The last two steps work the same as described before, so we will only discuss the first three steps in this chapter. In this chapter, we are going to assume that you have built a successful 2.6.17.9 kernel release, and want to upgrade to the 2.6.17.11 release. On the main kernel.org web site, you will remember that it contained a list ofthe current kernel versions that are available for download, as shown in Figure 6-1. Previously, you used the link pointed to you by the F to download the entire source code for the kernel. However, if you click on the name of the kernel release, it will download a patch file instead, as shown in Figure 6-2. *	It is called patch because the program patch takes the file and applies it to the original tree, creat-ing the new tree. The patch file contains a representation of the changes that are necessary to re-construct the new files, based on the old ones. Patch files are readable, and contain a list of the lines that are to be removed and the lines that are to be added, with some context within the file showing where the changes should be made. This is what we want to do when upgrading. But we need to figure out what patch to download. Which Patch Applies to Which Release? 2.6.17.10 patch will only apply to the 2.6.17 kernel release. The 2.6.17.10 kernel patch will not apply to the 2.6.17.9 kernel or any other release. Base kernel release patches only apply to the previous base kernel version. This means that the 2.6.18 patch will only apply to the 2.6.17 kernel release. It will not apply to the last 2.6.17.y kernel release, or any other release. Incremental patches upgrade from a specific release to the next release. This allows developers to not have to downgrade their kernel and then upgrade it, just to switch from the latest stable release to the next stable release (remem - ber that the stable release patches are only against the base kernel, not the previous stable release). Whenever possible, it is recommended that you use the incremental patches to make your life easier. *	Ifyou need to upgrade more than two versions, it is recommended as a way to save steps, to go backward and then upgrade forward. In this case, we could go backward from 2.6.17.9 to 2.6.17 and then forward from 2.6.17 to 2.6.17.11. In this example, we use the very good lftp FTP program to download the patch files. Any FTP pro-gram or a web browser can be used to download the same files. The important thing here is to show where the files are located. 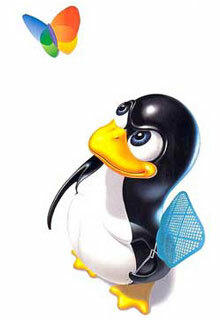 Previously, we used the make menuconfig or gconfig or xconfig method to change different configuration options. But once you have a working configuration, the only thing that is necessary is to update it with any new options that have been added to the kernel since the last release. To do this, the make oldconfig and make silentoldconfig options should be used. make oldconfig takes the current kernel configuration in the .config file, and updates it based on the new kernel release. To do this, it prints out all configura - tion questions, and provides an answer for them if the option is already handled in the configuration file. If there is a new option, the program stops and asks the user what the new configuration value should be set to. After answering the prompt, the program continues on until the whole kernel configuration is finished. make silentoldconfig works exactly the same way as oldconfig , but it does not print anything to the screen, unless it needs to ask a question about a new configura - tion option. So upgrading the kernel configuration for a new release is as simple as using a different configuration option to make . With this method, you do not need to use the graphical or text-oriented configuration programs for any new kernel update. The whole process ofdownloading the proper patch file, uncompressing it, and then applying it seems to be ripe for automating. Kernel developers being the type that like to automate repetitive tasks, the program ketchup has been created to handle all ofthis automatically. See Appendix A for more details on how this program works and how to use it. One of the hardest parts of building your own version of the Linux kernel is deter - mining exactly which drivers and configuration options are needed for your machine to work properly.This chapter will walk you through this process of finding and selecting the correct drivers. One of the easiest ways to determine which modules are necessary is to start with the kernel configuration that comes with your distribution’s kernel package.It is also much easier to determine which drivers are needed on a running system, where the proper drivers are already bound to the hardware. If you do not already have a Linux distribution installed on the machine that you are building the kernel for, use a LiveCD version of a distribution.This allows you to boot Linux on the machine and determine what kernel configuration options are needed in order to get the hardware working properly. Where Is the Kernel Configuration? Almost all distributions provide the kernel configuration files as part of the distri - bution kernel package.Read the distribution-specific documentation for how to find these configurations.It is usually somewhere below the /usr/src/linux/ direc - tory tree. Copy this configuration file into your kernel directory and rename it to .config . Then use it as the basis of the kernel configuration to build the kernel as described in Chapter 4. Using this configuration file should always generate a working kernel image for your machine.The disadvantage of this kernel image is that you will have built almost every kernel module and driver that is present in the kernel source tree. This is almost never needed for a single machine, so you can start to turn off different drivers and options that are not needed.It is recommended that you disable only those options that you are sure you do not need, as there might be parts of the system that rely on specific options being enabled. A configuration file that comes from a distribution takes a very long time to build, because of all of the different drivers being built.You want to build only the drivers for the hardware that you have, which will save time on building the kernel, and allows you to build some or all of the drivers into the kernel itself, possibly saving a bit of memory, and on some architectures, making for a faster running system.To cut your drivers down, you need to determine which modules are needed to drive your hardware.We will walk though two examples of how to find out what driver is needed to control what piece of hardware. Several locations on your system store useful information for determining which devices are bound to which drivers in a running kernel.The most important loca - tion is a virtual filesystem called sysfs. sysfs should always be mounted at the /sys location in your filesystem by the initialization scripts of your Linux distribution. sysfs provides a glimpse into how the different portions of the kernel are hooked together, with many different symlinks pointing all around the filesystem. In all of the following examples, real sysfs paths and hardware types are shown. Your machine will be different, but the relative locations of information will be the same.Do not be alarmed if the filenames in sysfs are different from your machine; it is to be expected. Additionally, the internal structure of the sysfs filesystem constantly changes around, due to the reorganization of devices and rethinking by the kernel devel - opers about how to best display internal kernel structures to userspace.Because of this, over time, some of the symlinks previously mentioned in this chapter might not be present.However, the information is all still there, just moved around a little bit. One of the most common and important devices in the system is the network interface card.It is imperative to figure out which driver is controlling this device and enable it in your kernel configuration so that networking works properly. The lo directory represents the network loopback device, and is not attached to any real network device.The eth0 , eth1 , and eth2 directories are what you should pay attention to, as they represent real network devices. The ouput shows this is an Ethernet device with valid IP (inet ) address assigned to it. Follow the /sys/class/net/eth0/device symlink into the directory within the /sys/ device/ tree that contains the information for the device that controls eth0 . Note that the /sys/class/net/eth0 directory might also be a symlink on the newer versions of the kernel. Within the directory that describes the device in sysfs , there is a symlink to the driver bound to this device.That symlink is called driver , so we follow that link. So we put the output of the long symlink traversal to the readlink location into the basename program, enabling the whole process to be done in one line. Remember to replace the e1000 used for this example with the name of the module that you are looking to find. The important thing to look for in the output of the previous find command is any line that has the term CONFIG_ in it.That is the configuration option that the kernel needs to have enabled in order to build the module.In the above example, the option CONFIG_E1000 is the configuration option that you are looking for. Then press the / key (which initiates a search) and type in the configuration option, minus the CONFIG_ portion of the string.This process is shown in Figure 7-1. The kernel configuration system will then tell you exactly where to select the option to enable this module. See Figure 7-2. These steps will work for any type of device active in the kernel. In our case, this displays the screen shown in Figure 7-4. This shows exactly where to find the USBProlific2303SinglePortSerialDriver option that is needed to control this device properly. Find the proper sysfs class device that the device is bound to.Network devices are listed in /sys/class/net and tty devices in /sys/class/tty .Other types of devices are listed in other directories in /sys/class , depending on the type of device. 4. Search in the kernel configuration system for that configuration value and go to the location in the menu that it specifies to enable that driver to be built. You can download an example file containing this script from the book’s web site, provided in the “How to Contact Us” section of the Preface. This script goes through sysfs and finds all files called modalias .The modalias file contains the module alias that tells the modprobe command which module should be loaded to control this device.The module alias is made up of a combination of device manufacturer, ID, class type, and other unique identifiers for that specific type of device.All kernel driver modules have an internal list of devices that they support that is generated automatically by the list of devices the driver tells the kernel it supports.The modprobe looks through this list of devices by all drivers and tries to match it up with the alias it has.If it finds a match, it will then load the module (this procedure is how the automatic driver loading functionality in Linux works). This is a list of all of the modules that are needed to control the hardware in the machine. Which means that it could not find a module that can control that device.Do not be concerned about this, as some devices do not have kernel drivers that will work for them. Sometimes you do not have the option of getting a distribution kernel working on a machine in order to determine what kernel modules are needed to drive the hardware.Or you have added new hardware to your system, and you need to figure out what kernel configuration option needs to be enabled to get it to work properly.This section will help you determine how to find that configuration option to get the hardware up and running. The easiest way to figure out which driver controls a new device is to build all of the different drivers of that type in the kernel source tree as modules, and let the udev startup process match the driver to the device.Once this happens, you should be able to work backwards using the steps just discussed to determine the proper driver needed, and then go back and enable just that driver in the kernel configuration. But if you do not want to build all drivers, or this does not work for some reason, it will require a bit more work to determine the proper driver that is needed.The following steps are complex and require digging in the kernel source code at times.Do not be afraid of this; it will only help you understand your hardware and the kernel source better. The steps involved in matching the driver to the device differ depending on the type of device that you are working with.We will discuss the two most common forms of devices in this chapter: PCI and USB devices.The methods described here will also work with other types of devices. PCI devices are distinguished by vendor ID and device ID; each combination of vendor and device ID could require a unique driver.This is the basis for the research this section shows you. For this example, let’s use a PCI network card that is not working with the currently running kernel version.This example will be different from your situa - tion, with different PCI device and bus ID values, but the steps involved should be relevant to any type of PCI device you wish to find a working driver for. *	Note that you can just try searching through the kernel configuration for a device that matches the string described here, a device from Realtek Semiconductor with a product name of RTL-8139/8139C/8139C+, but this does not always work.That is why we are taking the long way around in this chapter. If you are using a distribution that puts it somewhere else, please use that path whenever we discuss using lspci . The first few bits of the lspci output show the PCI bus ID for this device, 06:04.0 . That is the value we will use when looking through sysfs in order to find out more information about this device. These are the vendor and device IDs for this PCI device.The kernel uses these values to match a driver to a device properly.PCI drivers tell the kernel which vendor and device IDs they will support so that the kernel knows how to bind the driver to the proper device.Write them down somewhere, as we will refer to them later. *	Some 64-bit processors will show the leading bus number for PCI devices in the output of lspci, but for the majority of the common Linux machines, it will not show up by default. The defined value here, PCI_VENDOR_ID_REALTEK is what will probably be used in any kernel driver that purports to support devices from this manufacturer. That definition will be useful later. We don’t need to look at the first file listed here, pci_ids.h , because that is where we found the original definition.But the files r8139.c , 8139too.c , and 8169cp.c in the drivers/net/ subdirectory should be examined more closely. All PCI drivers contain a list of the different devices that they support.That list is contained in a structure of struct pci_device_id values, just like this one.That is what we need to look at in order to determine whether our device is supported by this driver.The vendor value matches here, but the second value after the vendor is the device value.Our device has the value 0x8139 , while this driver supports the device values of 0x8169 and 0x8129 for devices with the vendor ID of PCI_VENDOR_ ID_REALTEK . So this driver will not support our device. The use of the PCI_VENDOR_ID_REALTEK value here also corresponds with the code that checks whether the PCI device ID matches the PCI_DEVICE_ID_REALTEK_8139 value.If it does, the driver is to print out a message that says: “Use the 8139cp driver for improved performance and stability.” Perhaps we should look at that driver next.Even if we did not have such a visible clue, the 8139too.c driver does not have the vendor and device ID pair that we are looking for in a struct pci_ device_id variable, so that gives us the clue that it will not support our device. Here is a use of both our vendor and device ID values in a structpci_device_id variable. This driver should support our device. Now that we have the driver name, we can work backward, as shown in the first section in this chapter, to find the proper kernel configuration value that should be enabled to build this driver. Find the PCI bus ID of the device for which you want to find the driver, using lspci . Go into the /sys/bus/pci/devices/0000:bus_id directory, where bus_id is the PCI bus ID found in the previous step. Read the values of the vendor and device files in the PCI device directory. Move back to the kernel source tree and look in include/linux/pci_ids.h for the PCI vendor and device IDs found in the previous step. Search the kernel source tree for references to those values in drivers.Both the vendor and device ID should be in a struct pci_device_id definition. 7. Search in the kernel configuration system for that configuration value and go to the location in the menu that it specifies to enable that driver to be built. Finding the specific driver for a USB device is much like finding the driver for a PCI device as described in the previous section, with only minor differences in finding the bus ID values. In this example, let’s find the driver that is needed for a USB wireless device.As with the PCI device example, the details in this example will be different from your situation, but the steps involved should be relevant to any type of USB device for which you wish to find a working driver. As with the PCI device, the bus ID must be found for the USB device you wish to find the driver for.To do this, you can use the lsusb program that comes in the usbutils package. Bus 004 Device 002: ID 045e:001c Microsoft Corp.
is the device you want to find the driver for. This is because the USB device numbers are not unique, but change every time a device is plugged in.What is stable is the vendor and product ID, shown here by lsusb as two four-digit values with a : between them.For this device, the vendor ID is 157e and the product ID is 300d .Write down the values you find, as you will use them in future steps. We know this is a USB wireless device, and not an ATM or SCSI device, so we can safely ignore the files found in the atm and scsi directories.That leaves the drivers/ net/wireless/zd1211rw/zd_usb.c filename to investigate. shows that our vendor and product IDs are supported by this driver. Once you have the driver name that is necessary to control this device, work back - ward through the kernel Makefiles , as described earlier in the chapter, to determine how to enable this driver to be built properly. Find the USB vendor and product ID of device for which you want to find the driver, using lsusb after adding and then removing the device to see what changes in the list. Search the kernel source tree for the vendor and product ID of the USB device.Both the vendor and product ID should be in a structusb_device_id definition. The root filesystem is the filesystem from which the main portion of the running system boots.It contains all of the initial programs that start up the distro, and also usually contains the entire system configuration for the machine.In short, it is very important, and must be able to be found by the kernel at boot time in order for things to work properly. then the root filesystem wasn’t found.If you are not using a ramdisk image at boot time, it is usually recommended that you build both the filesystem that you use for your root partition, and the disk controller for that disk, into the kernel, instead of having it as a module.If you use a ramdisk at boot time, you should be safe building these portions as modules. How can you determine whether you are using a ramdisk at boot time? In Chapter 5 we mention using the distribution installation script to install the kernel versus doing the installation on your own.If you are using the distribution installation script, you are probably using a ramdisk.If you are installing it on your own, you are probably not. The following subsections show how to let the kernel find the root filesystem during boot. We are interested in the type of the filesystem, which is shown after the word type .In this example, it is ext3 .This is the type of filesystem that the root parti - tion is using.Go into the kernel configuration system and make sure that this filesystem type is enabled, as described in Chapter 8. In the output of the mount command shown earlier, the first portion of the line shows which block device the root filesystem is mounted on.In this example, it’s /dev/sda2 .Now that the filesystem is configured properly in your kernel, you must also make sure that this block device will also work correctly.To find out which drivers are needed for this, you need to look at sysfs again. 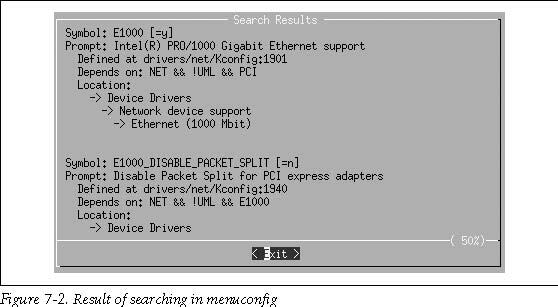 Here we see that the SCSI disk controller driver is responsible for making this device work.So we know we need to configure SCSI disk support into our kernel configuration. There! This is the disk controller we need to ensure is in our kernel configuration. So for this root filesystem, we need to enable the ext3 , sd , and ata_piix drivers in our kernel configuration so that we will be able to successfully boot our kernel on this hardware. As mentioned near the beginning of this chapter, files and directories within sysfs change from one release of the kernel to another.Here is a script that is handy in determining the needed kernel driver and module module name for any device node in the system.It has been developed with the kernel developers responsible for sysfs and should successfully work on all future versions of the 2.6 kernel.